I’ve been going to garage sales here and there for years, however in the past year or two, I’ve become a garage sale regular. I’m out at sales at least two Saturdays a month. And I’ve learned a few things. Every week I always think I should write a blog post about this. So I finally am. 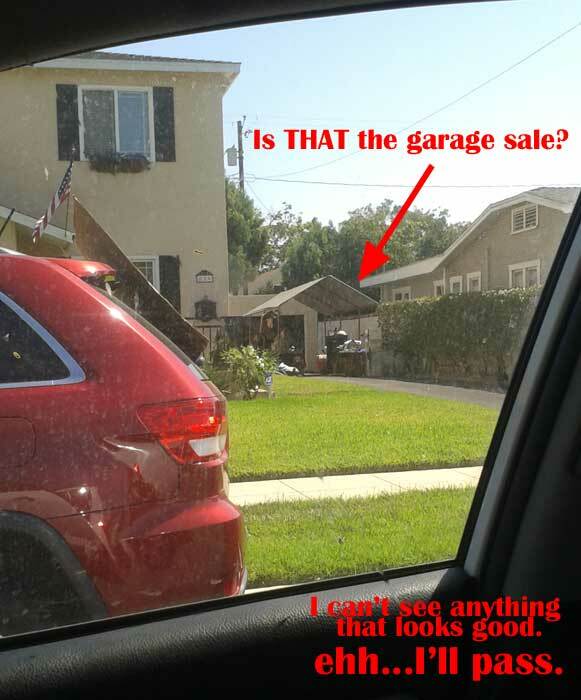 There are many ways out there to advertise your garage sale, and it probably depends on your specific community, but eh, I pretty much only pay attention to craigslist posting. No, wait, I don’t “pretty much only”. I ONLY. 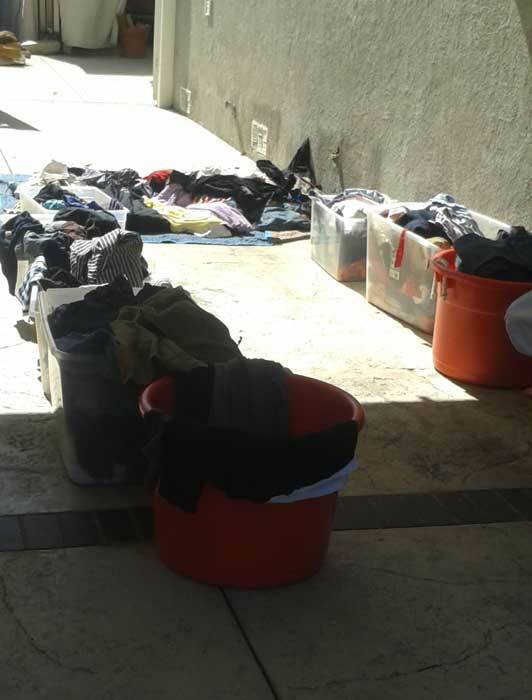 Here are some examples of what I do and don’t look for when planning out my garage sale trips. I’ll start with my biggest pet peeves and then move on to the better ads. I will pretty much NEVER go to either of these garage sales. Please don’t do either of the above. It’s just annoying. I don’t understand the fear (is it a fear of something? Or is there another reason people do this?) of posting your address online. I mean, maaaaybe if you were planning to sell something crazy super awesome worth thousands and thousands of dollars you wouldn’t want someone to know where your house is because they might steal it?? But um, these are garage sales. They typically don’t have anything worth that much at them. It is not wanting early birds to show up? Early birds (people who come to your sale way before posted opening times trying to snag things up before others can get it) are annoying, yes, but not giving out an address to avoid them is not worth losing all your other potential buyers. 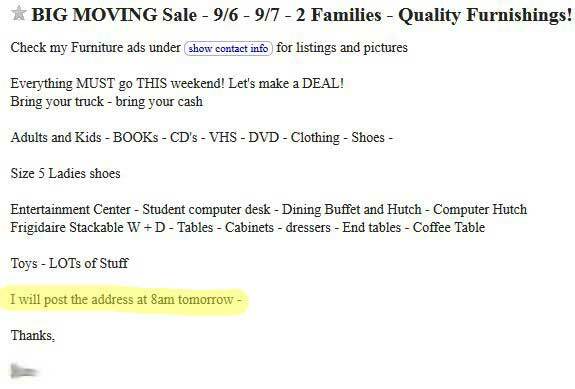 I plan out my garage sales on Friday night, usually late. I do not go back and check for updates on Sat. morning and I’m not going to call/text a stranger when it’s almost midnight. If you don’t list your address, I will not go out of my way to find your sale. Unless I was specifically on the hunt for patio furniture, an Electra bicycle or Ferrington guitar, I have no desire to go to your sale. 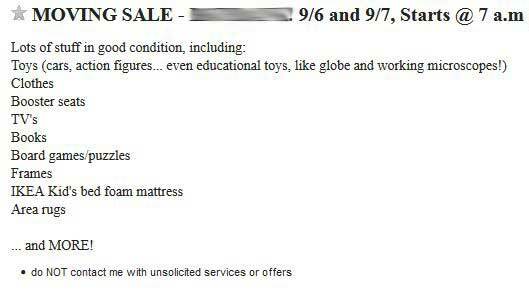 It makes me think that other than those three items, the rest of your sale is random junk you found around your house. If you really do have “lots o’ stuff” please tell me a little about it. No offense, but most people say they are having “huge” “massive” “gigantic” sales, but 75% of the time people overestimate and/or overvalue the things that have to sale. Saying you’re having a MASSIVE sale means nothing to me. Nothing. What are you selling? If you’re selling a massive amount of comic books or action figures, then I’m not interested, though certainly others will be. Now if you’re selling a massive amount of 3T girls clothes, then I will be the first one there, since that’s something I’m currently looking for. Tell me what you’re selling so I’ll know if it’s worth it for me to stop by! I’ll sometimes see sales that take place on Fridays. 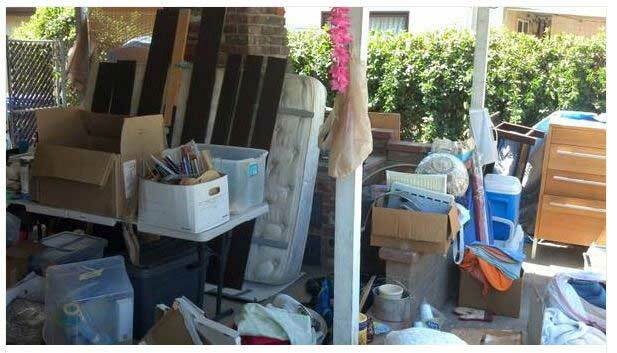 If it’s a full estate sale (the entire contents of a house), then a Fri-Sun sale makes sense to me. But otherwise, Fridays are not good days for sale…at least in this area. People work on Friday. Saturdays are best. Sundays are acceptable as a second best choice. 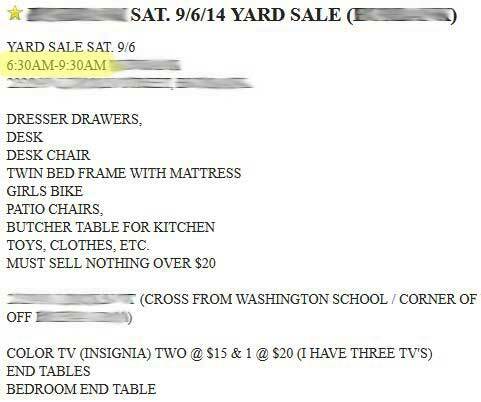 The above is rare and not something I’ve seen much of, but either way, ending your sale at 9:30am? Really?? Ha, sometimes I don’t even get myself out of the house until 9:30/10am! And I have other sales to go to too before I may be able to get to yours. I typically don’t head home from garage saleing until noonish. Unless you absolutely have to, don’t end your sale too early! Not everyone gets out at the crack of dawn; as long as you still have stuff to sell, there will still be people coming by in the late morning/early afternoon! This ad isn’t too bad. BUT I really wish I knew what size clothes they have! I’m currently looking for 3T girls clothing. This particular sale wasn’t super close to me, so I opted not to check it out, but had they specified that they were selling toddler clothes, or girls clothes, or even specified 3T clothes, I would have definitely gone! This post is ok. I really wish there had been more details of what they were selling, but for the most part, this works. This one’s pretty good. I wish that they had listed the time in the body of the post, but other than that, this was exactly what I look for when looking at garage sale posts! Specifics, details, and sizes. This is a good example of how you should post your ad. It’s got everything needed. Date. Time. Address, and also the nearest intersection. 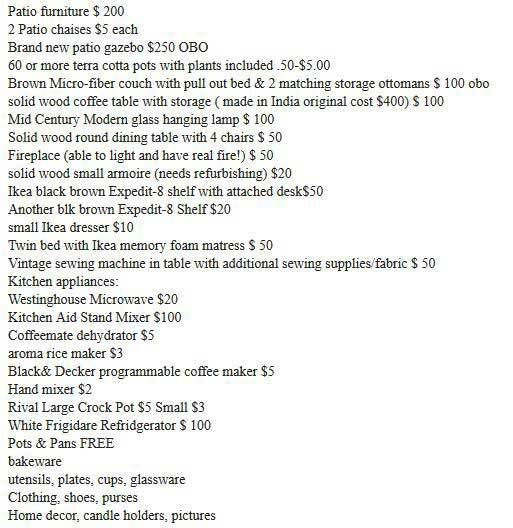 List of types of items being sold. Notice that I starred this post. These are the sales I mark down and plan to go to. Occasionally, I will see posts like the one below, with item prices listed in the ad. I’m a torn on this. On one hand, it’s kind of nice to know what kind of prices they’ll be expecting for their stuff. On the other hand, it’s kind of a turnoff. I garage sale because I like to find amazing bargains. Listing your prices in the ad makes me feel like you might overvalue your items and not be willing to negotiate. If you’re FIRM on selling your patio furniture for $200 and not a penny less, then I feel like you’re better off posting your patio furniture in a separate ad, with lots more pictures and a more detailed description of your patio furniture. You’re more likely to find a buyer who will pay want you want that way. Personally, I say to NOT post prices in the ad. Or if you really want to, only post prices for your really big ticket items. Otherwise, it might work against you and might cause some people not to come at all. For the most part, I’m a visual person. Many other people are visual people. We like seeing things. Pictures in craigslist ads are usually musts. But for garage sales? I say that if you don’t have any nice pictures to post, then don’t post anything at all. Do not post junky pictures! If the only pictures you have of some of your items are blurry, poorly lit, dirty, or cluttered, you are better off not posting them at all. Actually, I would say that I’m MORE likely to go to a sale that does not have pictures posted. I like the surprise of not knowing what I’m going to find. 🙂 And um, no matter what, don’t post pictures like the one above (which is a real picture from a real garage sale ad this past weekend!) – that does not look inviting. It looks exhausting and full of junk and not worth my time at all. Ok, now let’s talk about the day of the sale. Even if you had the most awesome listing ever with the easiest directions to your house, you’ll still want some signs posted. Please post signs. 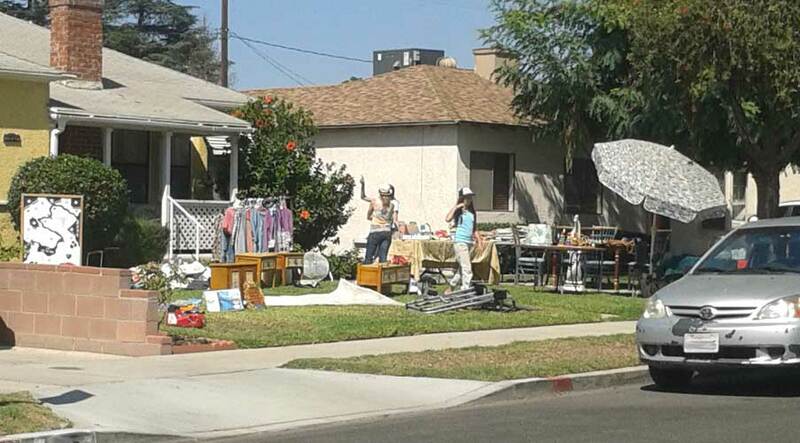 I’ve given up on planned garage sales because there were no signs and I couldn’t find the house. I’ve also many, many, many times decided to stop at a sale that wasn’t on my list just because I saw a sign notifying me of a nearby sale. Post signs. Post good signs. Neon paper with dark contrasting simple writing is best. 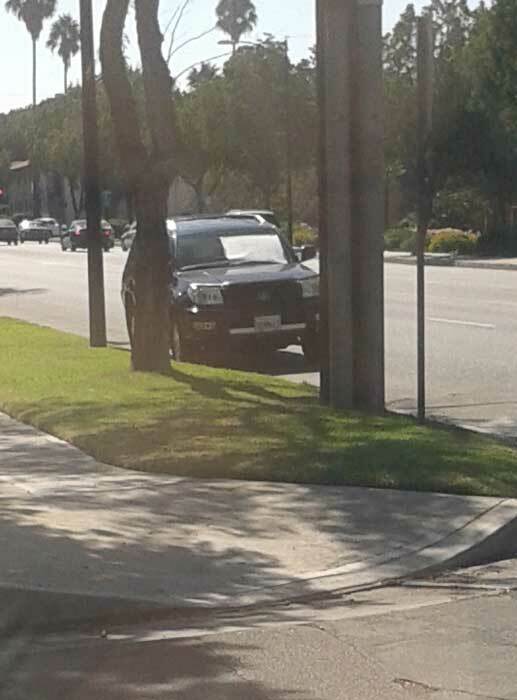 In my area, it’s common to tape the sign to a car and post it on the nearest busy street, like above. 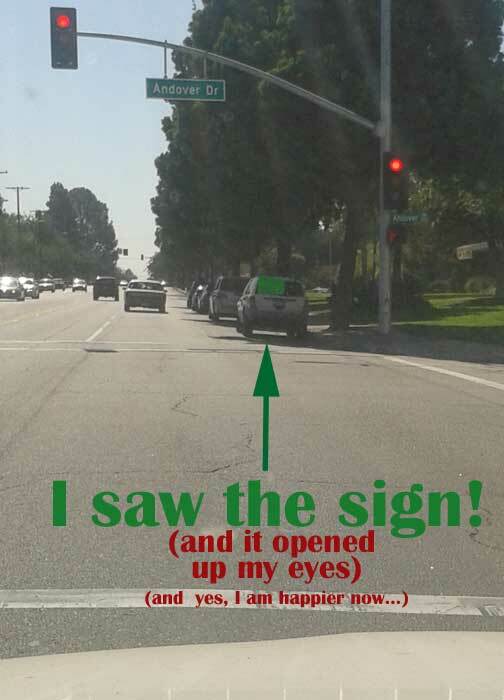 However, if someone driving by can’t read it, like above, then having a sign is pointless. I have no idea what that sign said. I just took a picture for the sake of this blog to use as a bad example. 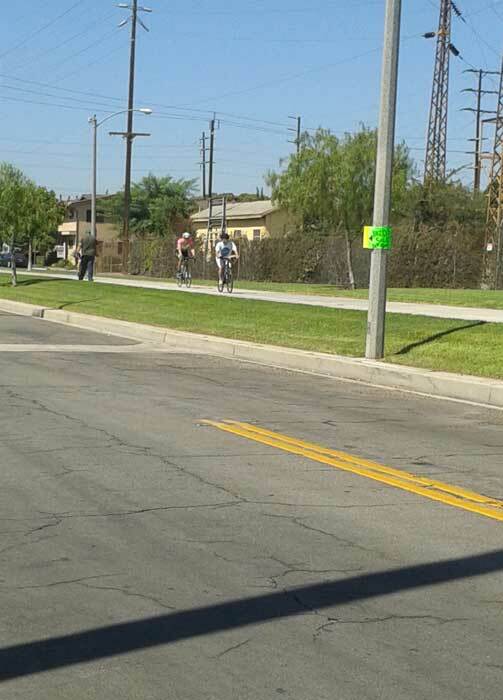 Though it’s hard to see from this picture, this is an example of a GOOD sign. I clearly saw it from my car. I could read the address. 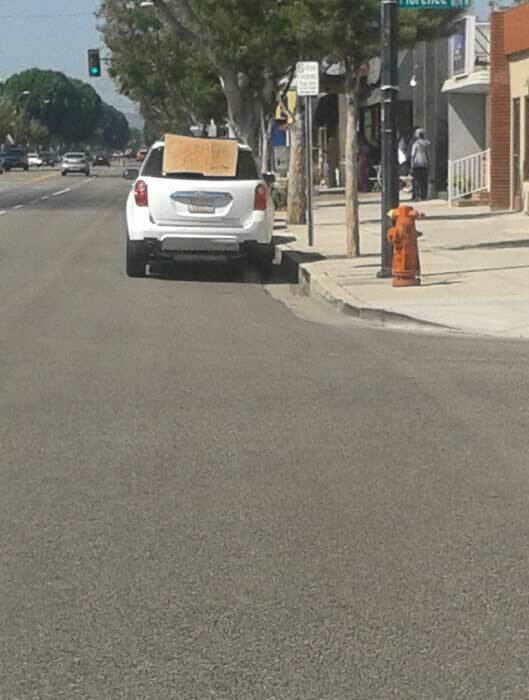 The car was parked at the intersection of the street the sale was on so it was easy for passerby to get to. To my garage sale expert eye, these signs are as exciting as a landmark on a treasure map. 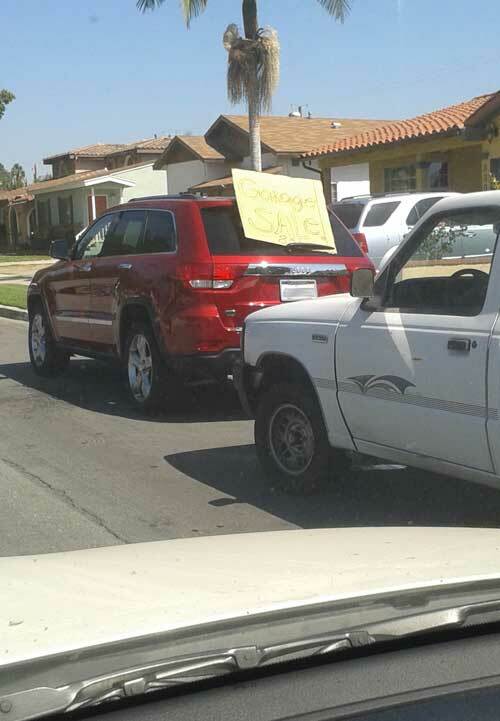 As a tip, don’t hide your sale way back in the back of your driveway. If at all possible, put items up in the front of your house or the front of your driveway! I have a lot of sales to potentially visit each Saturday; if I can’t see anything interesting from just driving by, I will pass it. Unless of course, I already had your sale written down from a post I found on craigslist as a sale I wanted to check out. But this above example I found only by the sign on the street. When I drive up to a garage sale, THIS is what I want to see! Oohh, stuff for sale! I should mention that I also only found this sale through a posted sign. Notice that a sign does not have to be huge and flashy to mean a good sale. It just has to be spotted. 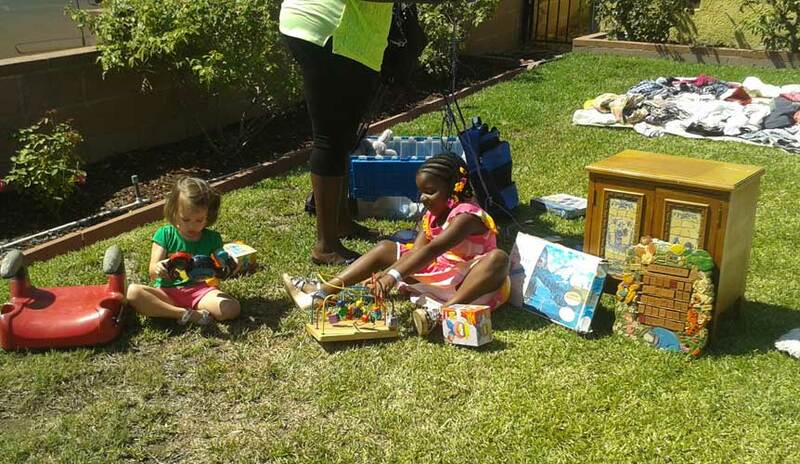 Hey, did y’all know that I typically bring my daughter with me garage saleing? We have mother-daughter time. Hopefully we’ll be able to keep it up as the years pass too, but right now, it’s just about teaching her how to behave at garage sales and how to use money. It’s fun and she likes exploring with me. 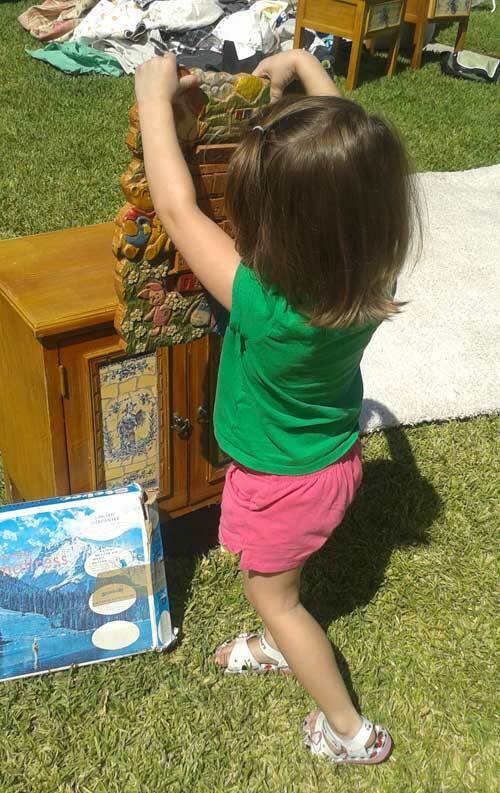 Here’s a picture of her checking out a Winnie-the-Pooh wooden calendar. We’ve gotten to the point where I’m usually able to let her play around and look at things by herself and I can step away a bit and look at things myself. She likes making new friends with other kids. Oh, I wanted to talk about clothes. I know that I probably once thought that it was weird to buy/sell clothes at garage sales, but eh, I’ve come to discover that you can actually find some decent stuff. Sure, it might be last season’s fashion, but seriously, I don’t care. 🙂 Also, I can sew. I very often buy things just because I know how I can remake or repair it. 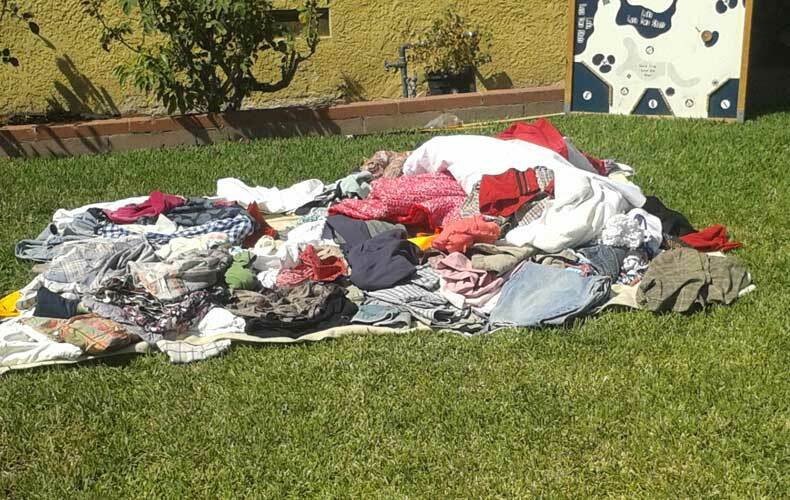 I can get clothes for $0.25 – $1 each. Even if I buy 5 things for $5 and then later decide I really only like two of the things, that’s still $5 for two new (to me) clothing articles! Ok, I think I’ve finally used up all the pictures I took on my garage sale adventure yesterday. I do, however, have more garage sale tips I’d like to impart to the world though.